How big is what’s calling you? 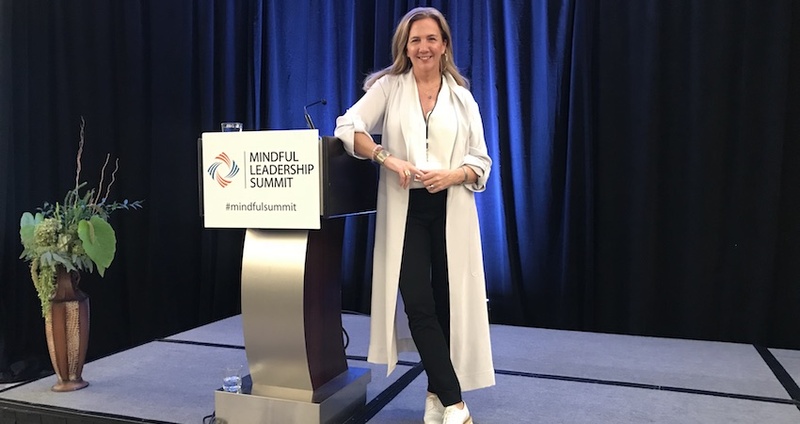 James Flaherty, a pioneer in embodied leadership coaching, explained how mindfulness helps us see that who we are doesn’t stop here, in our body, but extends out to a much vaster field. He shared one of my favorite Rumi quotes: “you are not a drop in the ocean, you are an entire ocean in a drop.” Being aware of how you are showing up allows you to be more effective. Connecting to your why is a beginning point. When you know your why, you can stay clear on intention. Our intentions affect our attention. Vulnerability is power. Do you have the courage to be vulnerable? Bill George, former CEO of Medtronic and Harvard Business School professor, shared his take on the real power of leadership – being open and authentic with others. This is what builds trust. He also shared a story about someone at the end of life, and provoked us with the inquiry: On your deathbed, how will you answer: what did you do to make a difference in this world? The time to think about this is now. Beyond attention and awareness – how do attitude and mindsets drive our outcomes? Amit Sood, the engaging Mayo Clinic doctor and resilience expert, explained that the brain gets tired in 60 minutes, and is hungry for RUM: Rest, Uplift (a positive uplift) and Motivation – knowing your why. This gets back to what James shared, and to the reason I named our company PurposeBlue. Purpose – our why – keeps us aligned and motivated, and creates a life of meaning. Amit also shared that it all begins with awareness and we can train attention, but we also must focus on the attitudes, or mindsets that make a difference. Here is his list of 5: Gratitude, Compassion, Acceptance, Meaning, and Forgiveness. He gave us the idea to assign one attitude to each day of the work week, making that your practice for the day. If you want to grow and scale mindfulness at your company, what are the most effective ways to do it? In a talk that I facilitated, we looked at how to get beyond mindfulness training as a one-time event. At Deloitte, we have grown from one to over 60 programs in 22 unique cities across the US. We looked at the blueprint for scale that starts with enrolling mindfulness champions at the top of the organization to drive sponsorship; creating a network of local ambassadors in each of the cities to “host” the events, and drive organic, informal learning; align the program to the business strategy, and have science-based, experiential sessions that get people out of their habitual ways of working and relating. When you make your program a mix of strategic, in-person live programs and virtual, self-paced on-going support offerings, with accountability and measurement – then overflowing classes, new behaviors and culture change are your reward. Give leaders tools for their own circles of influence – to implement mindful communication processes that boost openness, deepen trust and create more focus with their teams, clients and daily work. Where does it hurt? Bring compassion close in. Tara Brach, in her powerful clear voice, reminded us that we are wired for empathy, yet we focus on empathy for those who are close in to us. As we move into the busy holiday season, can you set the intention to tune in with more empathy to those right near you? In the video below, I share why we need to train the mind to help us offset our evolutionary biology and strengthen our capacity to be present for the life that is right here. How do these land for you? Share your own insights on our facebook page or tweet them to me at @lauriecameron. I am also enjoying the visual joy of Instagram – find me @lauriejcameron. The Mindful Minute: Offset the Negativity Bias from Laurie J. Cameron on Vimeo.